Digital commerce is taking off rapidly in emerging markets, and Southeast Asia is at the center of the revolution. In our first article, we explore what is driving this dramatic growth in the region, and thus highlight the essential prerequisites for e-commerce success more broadly. We then take a step back and offer strategies for achieving e-commerce success in the region and beyond, based on interviews with key influencers in the industry. Why Has E-Commerce Thrived in Southeast Asia? In many emerging Southeast Asian markets, e-commerce has yet to take hold as it has in many developed economies. Barriers to e-commerce growth have included weak electronic payments infrastructure, a dearth of payment providers and consumer hesitance to shift away from cash payment. But this landscape is gradually shifting, with expanding digital payments infrastructure and increased consumer acceptance of online and mobile payment methods throughout the region. How can MFS players take advantage of these shifting trends to strengthen their foothold in this fast-growing market? The e-commerce landscape in Southeast Asia is on the brink of a dramatic shift, with a perfect storm of enabling factors joining forces to establish the region as a promising new market for online and mobile retail. According to recent report on “Southeast Asia: Online Trends and Insights” published by Ardent Capital in September, e-commerce growth in Southeast Asia will experience annual growth of 31 percent until 2015. This sharp growth in e-commerce usage largely results from evolving infrastructure and consumer habits, as well as rising economic power in the region. One of the key barriers to e-commerce expansion in Southeast Asia, according to Aaron Chipper of InterAcct in a recent interview, has been the lack of enabling infrastructure for online or mobile transactions, such as extensive Internet access and/or smartphone penetration. But this reality is rapidly changing, with the Ardent report showing that, between 2010 and 2020, approximately 194 million people will come online in Southeast Asia. Growing connectivity will lead to the emergence of a virtuous cycle for e-commerce growth. For one, this will enable more small- and medium-sized enterprises to shift their businesses online, with consumers following suit. This is a critical shift in Southeast Asia, where SMEs comprise the majority of businesses and a bulk of the nations’ GDP. In Malaysia, for instance, SMEs make of 99.2 percent of all businesses and employ 56 percent of the workforce. However, many of these businesses have, until recently, lacked the resources necessary to establish a strong web presence and thus have been unable to sell goods or services via electronic channels. Of the one million SMEs in Malaysia, for example, only 30 percent have a website (eCommerce Milo). Many others have websites that are static and lack the capacity to facilitate transactions. With Internet access and data speeds increasing, developing online business fronts will become easier and easier. 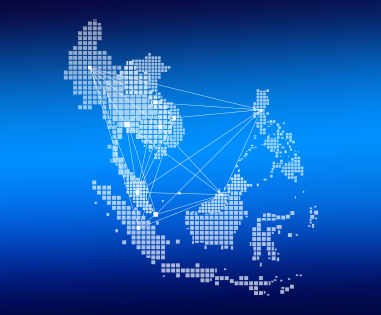 Beyond digital connectivity, weak physical distribution networks for delivering goods purchased via electronic channels have also presented a challenge in emerging Southeast Asian markets. According to a recent AT Kearney report, poor delivery infrastructure outside of metro hubs in emerging markets can inhibit efficiency of ‘last mile’ online retail product delivery. As consumer demand for e-commerce continues to grow, however, these networks will become more reliable and efficient. In many countries around the world, card-not-present e-commerce transactions are prohibited unless the consumer has a credit card. In emerging markets, such as many Southeast Asian countries, access to credit cards is generally limited, as many individuals either do not earn enough to qualify for a credit card or have poor credit history. Because many operate in a cash-only or debit card payment environment, widespread e-commerce usage has struggled to take off. But despite of a strong “cash culture,” every country in Southeast Asia is expected to experience growth in credit card transaction value between 2012 and 2017, according to the Ardent report. This means that more consumers will be able to use the growing number of e-commerce platforms, where they may have otherwise been excluded. Shedding an established “cash culture” requires not only the expansion of credit and debit card networks, but also education of both consumers and merchants regarding the added value of shifting to digital payments. In Southeast Asia, more and more consumers are gaining familiarity with digital transitions due to growing usage of mobile banking. This familiarity with conducting financial services via online or mobile channels may enhance acceptance of eCommerce, and thus increase trust in conducting financial transactions via electronic channels. The characteristics of Southeast Asian Internet users also open the doors for e-commerce growth. According to a recent ComScore report, “Southeast Asia: Digital Future in Focus 2013,” those under 35 are the heaviest Internet users in the region. The Ardent report further shows that more than 40 percent of the region’s entire population is between the ages of 15 and 40. While older generations may stick with tried-and-true payment methods, younger populations are often more open to online or mobile shopping, and e-commerce providers are thus increasing catering to the youth. Between 2007 and 2012, the GDP per capita throughout Southeast Asia grew in the double digits, and this growth is expected to continue through 2015 and beyond, according to the Ardent report. This growth will be bolstered by the anticipated establishment of the ASEAN Economic Community (AEC) by 2015, which will transform the region into an integrated market where businesses can operate and expand across borders more efficiently. These developments have far-reaching implications, including the potential for increased investment in e-commerce technology and more spending power among consumers. Since 2007, average disposable income in all Southeast Asian countries has increased by about 10 percent, and is expected to continue growing in the foreseeable future, according to the Ardent report. As these factors foster a growing e-commerce market, merchants and consumers are gradually shedding their cash tendency and entering the digital payments ecosystem. This has led to a dramatic rise in e-commerce players in the market, who are developing platforms to tap into this newfound demand for online and mobile payment platforms. However, entering new markets, particularly in emerging economies, brings with it a unique set of considerations and challenges, which we outline in the next article.